Daft Punk’s “Instant Crush”, which is featured on their latest album Random Access Memories, was released as a single on November 22, with a possible music video on the way. Two weeks ago, “Instant Crush” debuted on the radios in Italy and Poland. Hints about the release were given by Sony Music Poland, via facebook featuring what appeared to be the cover art for the upcoming single: “Instant Crush”. The post also included a caption in Polish announcing the distribution of the track to radio stations in Poland. 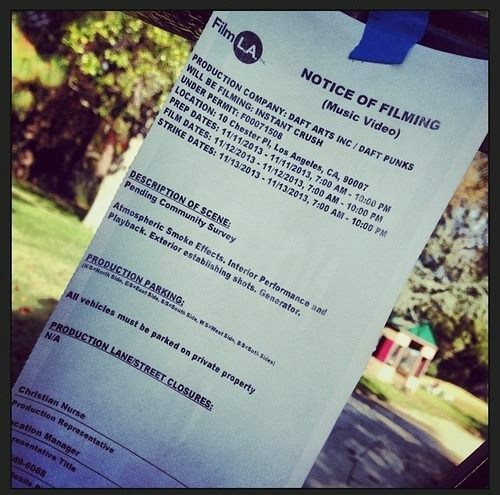 Rumors about a music video started to spread among fans when a picture surfaced showing a notice of filming, which has the band name written on it. The notice grants permission to record a video for Daft Punk’s newest single, which will take place in Los Angeles. In the same document, production notes like “smoke effects, interior performance and playback” can be read. Approximately one week later, Victor Wilde posted a snap of a jacket on his twitter account which was being redesigned in order to be used by Julian Casablancas, provider of the vocals for the song. The tweet reads: “Remaking this jacket for #juliancasablancas. He wears it in new #daftpunk video […]”. As for now, there is not official release date for the music video. How do you think the music video will be? Tell us on the forums!